You are here: Home / Blog / Does Early Detection Really Help? Does Early Detection Really Help? We all know people whose lives were saved because a medical checkup revealed an ailment in its early stages… early enough that treatment could help them avoid some devastating illness. Many of us have loved ones who are still with us because they believed in dealing with their health proactively. Such a proactive approach isn’t just limited to our bodies, though. We also check our roofs for potential leaks before the rainy season arrives, check the condition of our tires before a long trip and inspect our parachutes before making a jump or our regulator before the first dive of the summer. There’s a long list of routine checks we all perform, knowing that they may enable us to avoid undesirable consequences. It’s in our nature to avoid the undesirable. We take preventive measures hundreds of times each day. We look before crossing the street, we tell our children not to talk to strangers, we let the dog out when he whines – at work, we plan for contingencies, while at home, we save for a rainy day, we pay our electric bill on time, we look to see who’s at the door before opening it – we have learned to be proactive in nearly everything we do. Some of us are more proactive than others, of course. Some prefer to let the cards fall where they may, while others carry their proactivity to an extreme. Typically, those who are in business tend to fall in the middle. They plan, they double-check, they analyze and adapt – they aren’t inclined to leave things to chance. And those who practice their business online need to be even more proactive. But are they? Sadly, not always. Most online businesses practice some level of planning and analysis, adjusting their focus to seize new opportunities or to abandon efforts that offer little or no return. But there’s one area in which too many online business owners aren’t being proactive: the overall health of their website. With the website being the face of their online business, one would think that site health would get the attention it deserves. But another common human trait seems to often come into play here. Just as some people avoid going to the dentist until absolutely necessary, or getting a checkup from their doctor unless they’re applying for a new job or health insurance policy, many don’t take a look at the health of their website, lest it cause them more work. And unfortunately, just like a toothache or chest pain, at some point, something may happen to make them regret not having put their site under a microscope before symptoms appeared. At that point, they can no longer be proactive… they’re now forced to be reactive. Never an enviable position, and often costly. Does Every Website Need an Audit? The better question would be: does YOUR website need an audit? The answer to that depends on a number of factors. Basically, most of those factors deal with indicators of potential issues. I’ve performed audits that found so few issues that I actually discounted the agreed upon price by 50%. I’ve also told new clients that they didn’t need an audit, based upon my preliminary once-over. The fact of the matter is that sometimes a site is healthy enough as it stands. Not often, but sometimes. That doesn’t mean that there’s no room for improvement… just that there are no glaring problems that need to be resolved and no risk of a penalty or algorithmic filtering. Could an audit still be helpful? Probably. Would it be a wise investment of capital? Probably not. 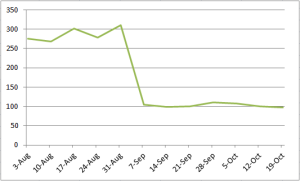 A recent drop-off in rankings or traffic, particularly if it coincides with an algorithm update. Those aren’t all the reasons, by any means… just a few of the most common. But even without any warning signs, it’s still a good practice to at least spot check the high-risk aspects periodically. Solving an issue before it becomes a problem is always preferable to having to suddenly react to an emergency. And it’s particularly frustrating when you realize that the mess you’re in was entirely avoidable, if only you had made the effort to give your site a checkup. How Deep Should an Audit Dig? There are many things to consider when looking at site health. Some (okay, many) can affect your search rankings. Others can affect your conversions, while still others may only affect your workload. Many auditors specialize in specific areas, such as usability, accessibility, conversions or content. A few offer a comprehensive audit, going into nearly every possible problem area to varying depths. If your website really needs an audit, a comprehensive approach will typically be the most productive. Think of it like a tune-up for your car… wouldn’t you normally change the oil and check the fan belts at the same time? Some auditors offer a “short form” audit… a 30,000 foot view, aimed only at identifying the specific areas that need a deeper look. For periodic checkups, this can be a good approach, as it can eliminate the effort of looking at many aspects of a site that show no evidence of any problems. Once potential problems are identified, a more in-depth examination of specific areas may be suggested. So the bottom line is, there’s no one best answer. Your website may or may not benefit from an audit. And if one is needed, it doesn’t necessarily have to dig into every single facet of your site. One thing is fairly certain, though. Just like a woman should occasionally check for lumps and a man should have an periodic prostate exam, a website should be checked now and then for health issues… before they become more serious.